If you haven’t had your vacation yet, don’t despair. You can fly around Europe at prices that rival train or bus tickets a few years ago. To find the cheapest airfares online, choose the least busy days to fly – i.e., Tuesday and Wednesday – avoid holiday periods, and stay at your destination at least over the weekend. This site lists low-fare airlines, including their destinations and rough prices. Seven firms currently fly from Ruzyně, and most direct links go to the UK. With Easyjet (www.easyjet.com/en/book/index.asp) you can go to London, Newcastle, Nottingham, Bristol, or Dortmund, Germany. BmiBaby Airlines (www.bmibaby.com/ bmibaby/en-gb/index.aspx) connects Prague to London, Cardiff, Teeside, Manchester, or East Midlands. You can find connections to Belfast and Leeds at www.jet2.com, while FlyBee (www3.flybe.com) will take you to Southhampton, a hub for reaching 14 other destinations. Since May, Ruzyně has been the home of the Czech low-cost airline SmartWings, with 10 Boeing 737s servicing Copenhagen, Madrid, Zurich, Paris, and Amsterdam – attractive destinations that were previously inaccessible on the cheap. This is particularly true of the latter two destinations, for which flights depart seven days a week. But prices vary greatly. 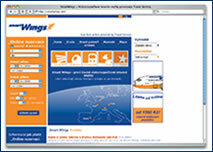 A round-trip to Paris with SmartWings can cost as little as CZK 1,820 or as much as CZK 5,750. The earlier you buy your ticket, the cheaper it will be. The cheapest tickets are sold first, and as the plane is filled, the prices go up. This on-line reservation system has the latest information on ticket availability with 750 airlines, including ČSA. Enter your place of departure and destination, and wait for offers and prices of various carriers. You can immediately reserve a seat, and confirm it over the phone. Bank transfers, cash, and credit cards are accepted as payment. 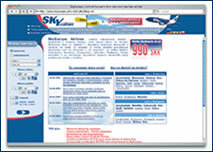 The site’s operator, Asiana, supplements the database with low regional tariffs, or nego-fares. Charter flights from Vienna, Cologne, Bonn, and Milan head beyond European borders. You can take low-fare airlines to get there. For example, you can get to Vienna via Košice with SkyEurope Airlines. Vienna is one of seventeen destinations reachable from Košice. Germany is covered by GermanWings (www20.germanwings.com), and the Mediterranean is covered byVolareWeb (buy.volareweb.com/sito_cz/index.html). Take an Airbus 320 to Milan and Venice and continue on to the rest of Europe, including Tirana, Albania for example. Call 800 142 331 to combine flights. Interest in 20% last-minute discounts is rising steadily, already accounting for 30% of all excursions sold. The offer is vast – hundreds of destinations, but it’s still limited, since prior to departure you don’t know which hotel or pension you’ll go to. 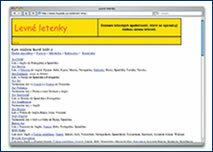 On the Centrum zájezdů na poslední chvíli page you can browse for cheap air tickets and excursions. Under “Last Minute” just enter the date you want to travel on, and in a short while a huge number of offers and prices will appear, with links for more detailed information. This site also offers German travel agency trips as well. If you don’t want to travel to shop, choose a more convenient method. 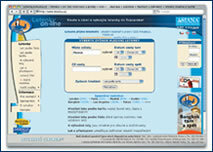 Enter this address and see a catalog of 1,519 web shops, including ratings and e-business information. This site offers a lot of useful information connected with travel abroad, including a list of travel insurers in this country. Each features a link to the home page, with tariffs and medical expenses in the event of injury or illness. One of the largest, fastest, and best laid-out sites. It contains databases of over 1.8 million firms and over 180,000 Czech internet sites, arranged according to business field and location. This hosting site is the first in the Czech Republic to allow each visitor his own weblog, “written, photographed, and recorded” from more or less anywhere over a mobile phone that supports MMS messages. – Global Positioning System is synonymous with a box the size of a mobile phone that helps you find your way under any conditions. Its display shows your geographical coordinates and a map of your surroundings. It can pinpoint your location to within 7-10 meters. GPS is based on many satellites that send signals about current locations. The system, used for many years by the US Army, reached the public only recently, and it’s only a matter of time until we all have GPS modules built into our cars and mobile phones. Once and for all we can throw out all our atlases, shredded maps, and city plans.